Like human mothers, Willow uses her voice and touch to bond with her child. Sadbh responds with her first cries. It is a bond that we can only begin to honour by taking individual responsibility to live as vegans who stop unnecessarily harming others, simply because we deem our desires to be more important than their lives because they are not human. The attachment between a mother and her new born child sets the template for that child's future. Motivated to prevent and ease her child's distress and to enhance the child's wellbeing to the best of her ability, a mother meets her child's needs, consistently. Through having his or her needs met, the child learn that distress can be both tolerated and soothed. This is the essence of future equanimity, inner peace and the ability to regulate emotion. The security of this bond enables exploration of the world, and it facilitates the development of self-sufficient, capable adults. It is where we first learn social reciprocity and social justice as we move from oneness with our mothers to separate, but interconnected, interacting, social beings. It is the bedrock of compassion. 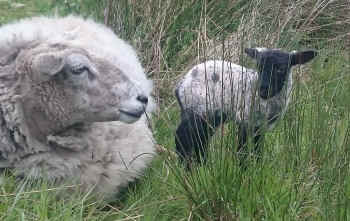 At only two weeks old Sadbh is already a very well adjusted lamb. From the security of her mother's side she ventures forth into her world at Eden, exploring new situations, meeting other people, courageously testing the limits of her world in the knowledge that she can run to her mother, and her extended family, for protection and assurance at the first hint of danger. She is learning social skills, self-efficacy, confidence and independence. These are the hallmarks of healthy psychological development in all of us. In this video we witness the sacredness of the first hours of the bond of motherhood between Willow and Sadbh. Like human mothers, Willow uses her voice and touch to bond with her child. Sadbh responds with her first cries. Human analysis of this deeply touching scene is limited by the bluntness of our own sensory capacities; Willow and Sadbh may be bonding in ways that we can barely conceive of. Bearing witness to this beautiful scene, however, leaves us in no doubt of the sacredness of motherhood, regardless of species. Yet, it is a bond that we routinely sever in those who are not human, despite claiming to honour its importance, its sacredness. It is a bond that we can only begin to honour by taking individual responsibility to live as vegans who stop unnecessarily harming others, simply because we deem our desires to be more important than their lives because they are not human.